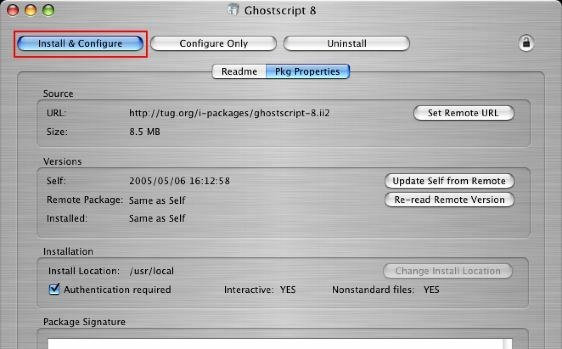 How to install Ghostscript using i-Installer. Some aplications like Scribus need Ghostscript to manage EPS images. Download i-Installer and follow instructions (as are reported here). 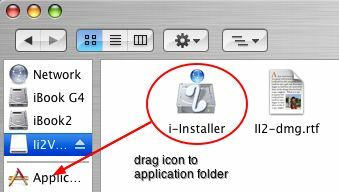 The i-Installer application download can be found here: II2.dmg. This will download a disk image. A disk image is a file that contains an image of a disk. Such a file can be used just like a disk can. You need to mount that disk image. Mounting a disk image can be done by double clicking it in the Finder. When the disk image has been mounted, you will have an extra ‘disk’ listed in your Finder window. On it you will find two files, a README file and the application itself. If you want i-Installer to be available permanently, copy the application on the mounted disk image to /Applications (or /Applications/Utilities) by dragging it in the Finder. Run i-Installer by double clicking it and (if you are connected to the internet) select the Known Packages submenu. You will be presented with a list of known packages. In the new window click on Install & Configure button and insert password when request. Now i-Install download and install Ghostscript package as prompted in the Status Messages. Click Yes button to add /usr/locl/bin to your Command Line Interface environment. And this message tell you that the installatiopn finished without errors.